I am working on a new exhibition for February 2020: ‘Dissent and Displacement’ at The New Walk Museum and Art Gallery, Leicester. Read the working brief here. If anyone has interesting connections with Leicester please do contact me! 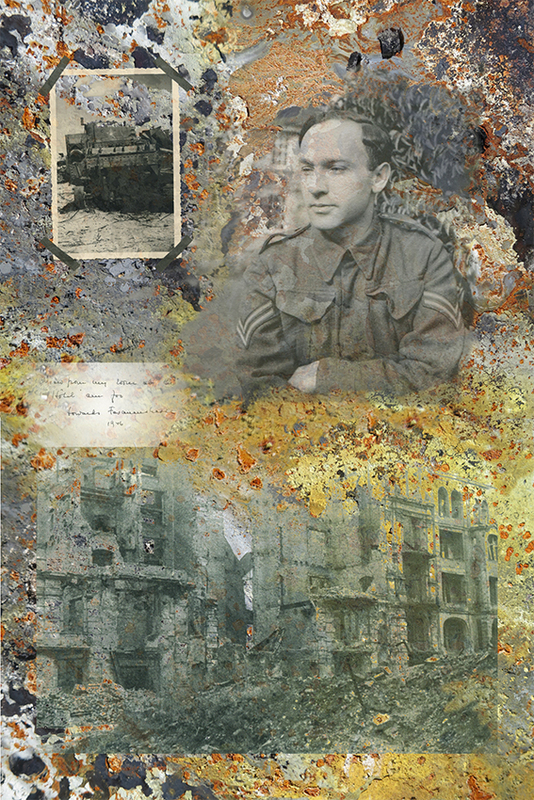 I will be exhibiting excerpts from the Coventry Dresden Towers at Kings College London from the 1st November 2018 and from the Dresden Indelible Marks exhibition at the Knapp Gallery at Regents College from the 2nd November 2018. 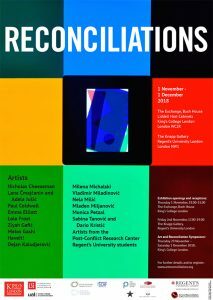 This is part of my participation in the AHRC funded ‘Art & Reconciliation: Conflict, Culture and Community’ on which I am on the advisory board. I am delighted to be currently showing at the International Printmaking Bienale in Duoro, Portugal, invited by one of my printroom artists Danielle Creenaune. A fascinating piece about dentistry under the Third Reich, including my grandfather Dr Erich Isakowitz. Read Malcolm Bishop’s article in the Dental Historian. The Detritus of War I, Digital Archive, 150 x 100 cms, unique. The Detritus of War II, Digital Archive, 150 x 100 cms, unique. To a death in sweating wakefulness was an exhibition by Dawn Cole, Johanna Love, and Monica Petzal. 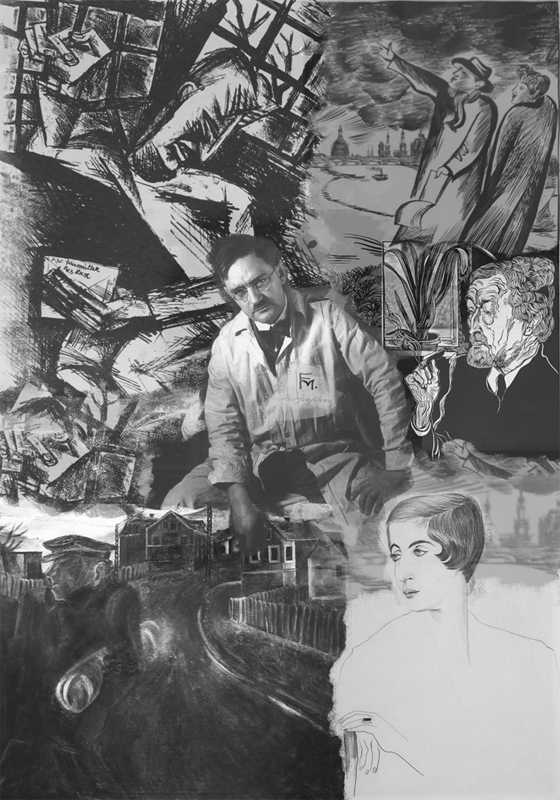 Each artist traces back through their own family archives, German and British, to explore the emotional and physical impact of the conflict during the First and Second World War. All three artists share a fascination with looking back to the impact of war and conflict present in their familial pasts. Each draws on family photographic archives and oral histories to make work that embodies the inescapable emotional and physical uncertainties of living within conflict. Indelible Marks -The Dresden Project at the Herbert Museum and Art Gallery, Coventry closed on the 7th February 2016 .You can read the book of the exhibition here. 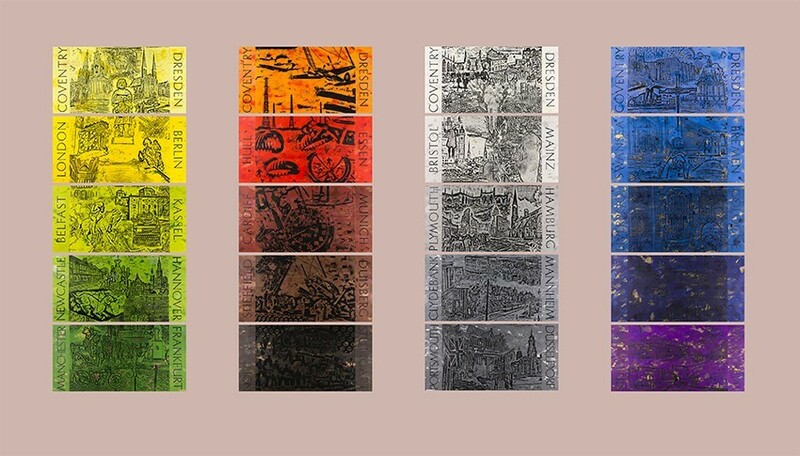 There is an article about the background and the work in Jewish Renaissance. The Coventry Dresden Facetime is being kept for the City of Coventry and ‘Blasted’ has been bought for the Herbert Museum permanent collection. It will shortly go on public view again as part of the ‘new aquisitions’.The 75/70 installation in Coventry Cathedral was taken down on Monday 18th April and will be retained by the City of Coventry under the auspices of Culture Coventry. The explanatory leaflet about the background and the content of the cathedral installation can be read here. 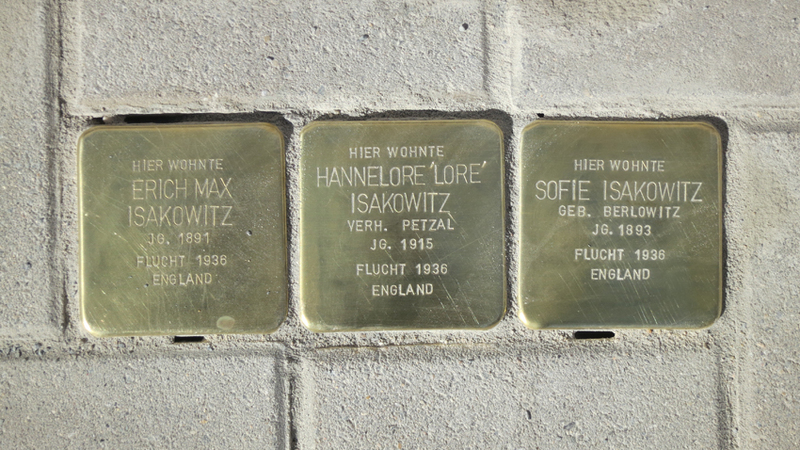 The Stolpersteine for my grandparents and mother outside the site of their former home at Werderstrasse 44, Dresden Plauen. There is an article about the Dresden and Coventry projects in the winter 2015 edition of Printmaking Today, many thanks to Anik See who interviewed me, you can read it here…. From January 23rd 2015 until 1st March 2015 , the Dresden Project was exhibited at the Kreuzkirche, Dresden. This was for the 70th anniversary of the destruction of the city.The opening was on Friday 23rd January 2015 see images of the opening and the installation . There was a special opening on Thursday 12th February from 18.00 in the presence of HRH the Duke of Kent and invited guests at which I, the Kreuzkirche Pfarrer Holger Milkau, the Mayor of Dresden, Helma Orosz and the Chair of the Dresden Trust spoke.The TV coverage can be seen here.The speeches made the artist in English and by Mayor Helma Orosz in German can be read here. The Press Release by the Dresden Trust can be viewed here. The City of Dresden Press Release in German release can be viewed here.